Birmingham City have issued a statement to totally refute reports that they are in financial trouble, at a time when speculation is increasing that they may have a new potential buyer. BBC WM 95.6 reports that former Swindon owner Jeremy Wray is behind a bid for the Championship club, who have been up for sale for two and a half years. That has not been denied by the club's Hong Kong-based parent company. But alleged worries over finances have been "categorically refuted" by Blues. A statement released last week by former chairman Peter Pannu, who severed ties with Birmingham in October, hinted they would struggle to pay a seven-figure corporation tax bill to Revenue and Customs (HMRC). Birmingham City are unbeaten in five matches since former Blues player Gary Rowett became manager on 27 October. They have won three of them, drawn the other two and risen six places in the Championship table from 23rd to 17th. But Blues responded in a statement, saying: "Whilst the club does not wish to comment on the specifics of its tax affairs as this, under normal business protocol, is a matter for it and HMRC, the corporation tax returns will be filed under due process and any tax due will be paid on time. "The club wishes to allay any fears that may now arise on the basis of the allegation there will be no funds beyond January/February 2015 - this is categorically refuted." Blues also pointed out, with regard to new talk of a potential takeover, that a statement was released by their parent company, Birmingham International Holdings, on the Hong Kong Stock Exchange on Monday, saying: "From time to time, the company has received indicative, non-binding offers from various third parties in relation to a possible acquisition of a controlling interest in Birmingham City Plc." "Jeremy Wray insists he has tabled a bid for Birmingham City. He has told BBC WM that his current offer was made on 1 November, but he has not been given permission to do an updated due diligence. 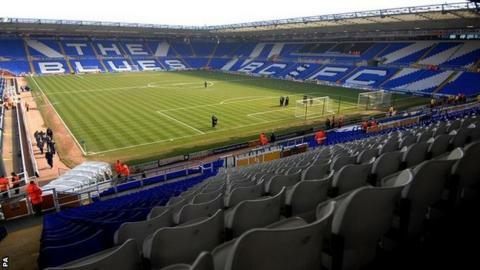 The club's current owners Birmingham International Holdings have been reluctant to sell as it would jeopardise the company's listing on the Hong Kong Stock Exchange. However, Mr Wray believes there is a way of progressing the deal without BIH losing their HKSE status." Given the recent upturn in results under new manager Gary Rowett, the club have also expressed their disappointment at the timing of this latest chapter in their whole turbulent story since the Gold brothers and David Sullivan sold out to Hong Kong businessman Carson Yeung, now serving a six-year prison sentence for money laundering, five years ago. The club statement added: "All involved at the club are wholly unimpressed and saddened by the unprofessional and ludicrous actions taken which seem intent on discrediting and damaging individuals and the club. This is entirely unnecessary - particularly at a time when the team is performing very well under a new manager and our supporters are buoyant and enjoying some positive results."